The twins are 17 months old now, and they alternate between being the best of friends and driving one another crazy. Either way, they are typically always side by side. Reid is much bigger than Cort. By almost 5 pounds. And he uses his size to an advantage. He gets in moods where he just torments Cort. 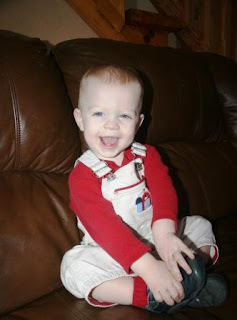 He's fast and he goes after whatever Cort has, including his cherished paci. Worst, though, Reid goes after his snacks. See, Reid can eat REALLY fast. I have no doubt that if all else fails career-wise, he can be one of those professional hot dog eating contest winners. For real, this child can eat and he can eat quickly. So I'll put a plate of animal crackers on the floor, and Cort will examine them, take a small nibble off, and rotate them in his hands. During the time it takes Cort to test the waters with his animal cookie, Reid will have eaten the other twenty. And then it happens. Reid notices that while there are no more animal crackers on the floor, Cort has two in his hands. Cort, not naive, will start trying to run away. Only Reid is faster and bigger. Reid comes up from behind, arms wide open, and tackles Cort to the floor. Cort, completely smushed to the ground, loses possession of both animal crackers as Reid quickly wrenches them from his hands and stuffs them in his mouth, all while Cort is penned down and sceaming. Reid has started getting little tiny time outs on the couch. Yeah, I know you're not supposed to start time out until the age of two. Nevertheless, I place Reid on the couch and tell him no and that he needs to be nice to Cort. Somehow, time outs and lectures don't seem to make a dent in Reid. In fact, I suspect he finds them amusing. I may need to reconsider my approach. With a smile like that you just want to give him another cookie or go eat a box of your own. aww...poor cort! imagine how much more he'd weigh if Reid didn't eat all his food! I liked Mere's comment above. :) You've got your hands full! Oh, boy! I know how that goes . . . Livie is the SAME way when she's in a time-out. In fact, when she knows she's done something I don't like, she'll tell me to put her in a time-out! So I've had to skip the time out and tell her "Okay, you're not getting a time-out. You just won't have any books at bedtime!" and then she cooperates. Ha ha! What a cutie! Whatever works! Is there some place "safe" you can put Cort for snack time? Maybe in his high chair? You want to make sure that you teach Reid not to steal food, naturally. But you also want to make sure you don't accidentally teach Cort that he has to fight in order to get enough to eat. Thanks Julie. I could put him in a high chair for snack, although he has a habit of just tossing his food to the floor so he can watch the dog eat it. He's just a slow, lazy eater. But I'll give it a shot. i've always made it clear that we don't take food off other's plates without permission. maybe two plates of cookies are in order? This story was so cute. I could just envision him chasing his brother and smashing him to the ground, thinking, "COOKIES!!!" Ha ha! That smile, oh my goodness is he adorable! That rundown of what happens to crackers was cracking me up. You have a side-show going on in your house. This happens in my house too only my 16 mo old usually had the upper hand on the older 2. She grabs thier long hair & runs the other direction. Oh man, I need to try the time out method LOL. lol yep, looks like you might have to find another way to discourage him. Hes having too much fun in that time out! Love this story. He is a fiesty one huh!?! Good luck! I started time outs that early and I don't think it hurt her at all! They do timeouts that early at daycare too! Hopefully one day it will stick with him!